Hello everyone, it’s a pleasure to be here today and to share our patient story within you all. My name is Yvonne and if you can’t tell already from the strange accent, I’ve travelled down from Glasgow in Scotland with my husband Martin and two of our three boys, Hayden and Evan. Our son Hayden who is 7 years old was diagnosed with BRRS which is one of ‘the branches’ if you like, of PTEN HTS. He was diagnosed about 4 years ago when he was about 3, I believe, just before he started nursery. . As you may already know, along with several other things, some of the common features of BRRS MAY include Macrocephaly (large head), large birth weight, developmental delay, and intellectual disability, and other things in addition to this, but not always all of these things. It was Hayden’s birth weight and large head size, that first promoted our Health Visitor to ask our GP for a referral to Genetics. Hayden was born in July 2011 weighing 11lb 13oz after a pretty traumatic birth for us both and an emergency delivery due to his weight and head size. No one, including myself, was immediately concerned about Hayden and we all just put him down to a ‘larger than normal baby’ and apart from being unable to hold his head up on his own when he should have been able too, he met all of his developmental milestones on time. However, as he continued to grow off the chart we re were referred to genetics by our Health Visitor, who was the only one with concerns and who we thought was overreacting. Our Genetics Doctor ordered bloods and investigated etc and soon after we received his diagnosis of BRRS / Pten Syndrome. I’m not going to lie, receiving that call was like being punched in the stomach. I was in shock and extremely upset and I didn’t have a clue what this ‘disease’ was or what it meant for my boy. The only thing I took from the conversation was the ‘C’ word and that I had or would soon have a very sick son. Thankfully that’s obviously not the case and I’m a bit better informed now than I was immediately after that call, but diagnosis was an extremely scary time and if your anything like me, the first thing you’ll do is run off to the internet, which, lets be honest, as useful as it can be, in some situations, it’s not always a helpful tool! From what I remember, the only information I could find on BRRS and PTEN Syndrome were all all doom and gloom. Maybe it wasn’t, but frantically searching the net, that’s all I took from it. So, thank goodness for days like this and a network of PTEN patients where we can gather together and share up to date information,positive stories and just get support when we need it. After Hayden’s diagnosis, my husband, myself and my other 2 boys were tested for a mutation in the PTEN gene but all of our tests came back negative, meaning that Hayden’s mutation was completely sporadic and wasn’t hereditary. Which I think was a surprise to the Genetics Doctor as she pretty much convinced us that it was highly likely that Martin or myself would be the carrier. So apart from the physical things Hayden has associated with PTEN, his Macrocephaly (large head), being tall for his age, Hayden was also diagnosed as having autism just before he started school aged 5. However, we feel feel extremely lucky, that although he is autistic and sometimes that is obvious in the way he interacts with others and the way he is socially, we feel blessed that so far, he attends mainstream school and is very much on par with his peers education wise. In fact he is in the top reading group in his class and last year was so far ahead of his classmates, that they sent him to another teacher for his reading so he wasn’t being held back! He’s also a great speller, loves maths and he actually loves school and adores learning, he’s like a little sponge, tell him something once and he absorbs it in and won’t forget. He’s got a huge circle of friends and has a better social life than probably most of us in this room! He goes to youth club, after school sports, swimming, karate and football. Due to his autism (or perhaps PTEN, I’m not sure) he does lack coordination, we’ve accepted the fact he’s never going to be the best Pele or Messi but that’s not important to us. It’s just important that he does things he enjoys `and lives life as ‘normally‘ as he can. 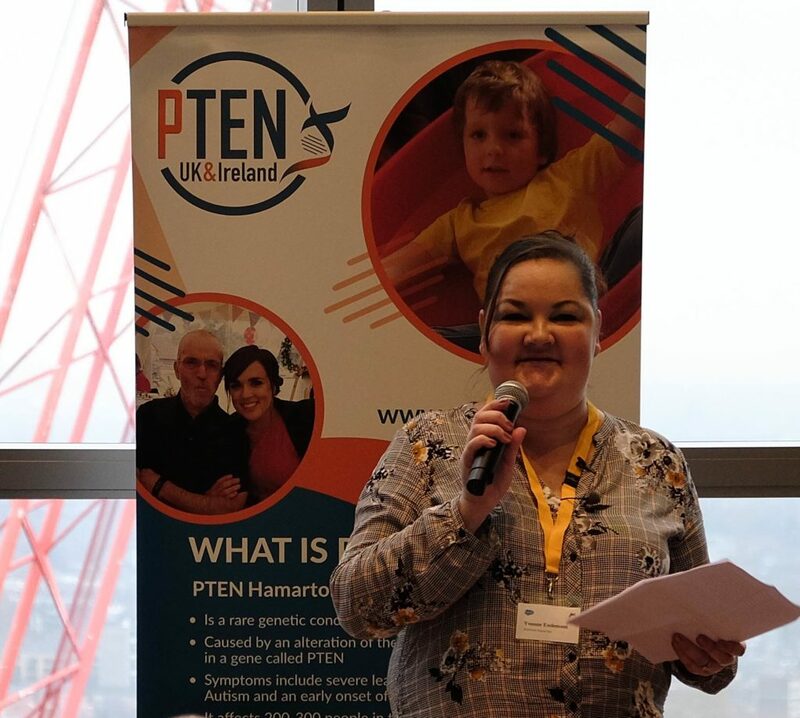 Our close family members and friends know that Hayden has PTEN syndrome and we have tried to explain to them what it actually is, but to be honest, all they take from it, is that he has a genetic condition that increases his risk of developing ‘other things’ (Cancer) in the future. I personally don’t feel that we as a family should dwell on Hayden’s Pten Syndrome or his associated autism on a daily basis, they are just part of what makes him, him. He’s so much more than a child with a PTEN and Autism diagnosis. He’s an amazing wee boy, he’s unique, he’s smart, he’s funny, he’s incredibly loving, he is super kind to all his classmates and will be right over there to comfort any of them if he seen they were upset, or he’d offer to play with them if he seen they were lonely and for me, this is a bigger part of who he is. Perhaps without his PTEN or Autism diagnosis he wouldn’t be the same person, and I wouldn’t want that, I wouldn’t change a single thing about him. However, while we don’t dwell on his diagnosis of PTEN syndrome, its obviously important to us to keep an eye on it – So treatment wise..
Again, we feel very lucky that all of Hayden’s care, takes place under the Glasgow Royal Hospital for Children, which is part of the QEUH (Queen Elizabeth University Hospital) which is a brand new, state of the art, hospital which is also known as “Scotland’s Super Hospital”. We can literally see the hospital from our front door, so we never have far to travel for any of Hayden’s appointments. At the present tome, Hayden is under the care of an Endocrinology Doctor (lovely guy, Dr Guftar Sheikh) who he sees once a year and who organises a yearly thyroid scan and this year has started taking some blood too, to check liver, kidney function, and I’m sure he mentioned vitamin levels too etc? This is the first time he’s had bloods done, so we will see how that goes, hopefully it’ll all be normal, I’m sure it will. Hayden used to also sees a dermatologist once a year for a skin check, but now we just advise the Endocrinologist (Dr Sheikh) if we have any concerns and we can just be referred across to the Dermatologist. It was fine when he was younger having his skin checked from head to toe but as Hayden gets older, he’s 8 next year, you’ve got to respect his privacy when a female Doctor wants to remove his underwear in front of mum and dad and any students in the room, to check the skin in his nether regions. I feel as a mum that his skin is something I can see daily and when he’s being bathed etc so I’m happy to just be referred back to Dermatology if needed. What works for one family might not necessarily be what works for another, its just trying to gauge what you feel is best. Hayden also gets a yearly eye sight test and then on the same day, he has an in-depth look into the back of his eyes by a Consultant Ophthalmologist. At the moment, he has no symptoms and as far as we are aware, this is the only checks he will have until he is much older. I know its not perfect, but I am a HUGE lover of our NHS system I rate it highly and I think we are extremely lucky to have such a system here in this country and personally, I can’t fault them or the care they have given to us. I am happy that we got a relatively quick diagnosis and the referrals to the correct departments for his checks, and even though his checks are yearly, I know that if I have any concerns between these times, then one phone call and they’d fit him in as soon as they could before that. So my experience of the medical care we have received is definitely positive. Thoughts for the future: At the moment I’m happy to take each day as it comes and I don’t spend too much time overthinking the future. Of course, I do think about it at times and probably one of my main concerns is explaining the syndrome and its possible implications to Hayden without causing him too much anxiety or upset. He’s already asking questions about why he needs check ups etc but I just try to keep it age appropriate for him, telling him that we all have this gene called PTEN but his works a bit differently, so they just want to check every years to make sure he’s healthy. And I think if I had any advice or tips to give caregivers, especially of younger children. Would just be honest with them, keep them informed and up to date, let them be a part of and have a say in their care but keep it age appropriate. Obviously everyone knows their own kids best, but I feel if you keep them involved and talk through their concerns etc then they will probably have less anxieties and worry less. I certainly find this to be true with Hayden anyway. I’ve also found it useful to keep not only his school, but his class teacher informed of his condition as well as the issues that come with it, issues that may seem trivial, like his large head size, but we’ve got to remember that in normal ‘school activities’ this can pose problematic and at time embarrassing situations for kids. For example in nursery they all had a graduations ceremony and all wore their mortar hats but Hayden had a ridiculously big one that had been cut up the back! And whilst I appreciate the effort they went to, it just singled him out in front of the other kids as being different. We got a way with that as he was only young, but now I try to keep on top of things. Like this year in the nativity he is playing King Herod and I’ve already written to the teacher explaining that I will provide him with his crown. I don’t want them trying on all the crowns they have in the props department in front of all the other kids only to discover that surprise surprise, none of them fit! Hayden now understands that he has a large head and again trying to keep it age appropriate for him, I’ve just told him that its due to his PTEN syndrome but how can he have have a smaller head when he’s so clever?? He needs a head large enough to hold a big clever brain! It’s just small things like that I try to solve before they become an issue, because no kid wants to stand out for the wrong reasons at school. I know I probably wont always be able to protect him from every single situation that might arise, but if I can, I will! Newly diagnosed: To anyone who has perhaps been recently diagnosed, the first bit of advice I would give, is don’t panic! I know that is easier said than done but I wish I could have told myself that when I first received that call. Also,don’t go believing everything you read on the internet or blindly go googling things. Of course, go ahead and try to educate and inform yourself. It is a rare disease and 99% of the time, you’ll know more about the condition than the Doctors you meet. But make sure your information is taken from reliable sources, like out PTEN UKI patient group or from proper medical journals etc. Work with your Doctors and Consultants, they may not have come across this syndrome often, or at all but give them a chance to learn about it, and at the end of the day we cant expect them to know everything but at the end of the day, they will want what’s best for their patients too. Also if you think that you or your child should be getting something that you are not, then ask for it. From personal experience Ive found our Doctors to be more than accommodating. At first they told us they wouldn’t scan Hayden’s thyroid until he was in his teens, as it wasn’t deemed necessary but I just asked if they’d please do it for my own peace of mind and they seemed happy enough to just do it. – And keep up to date with this group! So that’s Hayden’s patient journey so far and we just hope for many more, uneventful years ahead and yearly check ups that quickly all come back showing that everything is good. Thank you for listening and thank you for your time.